Feel the Wind in your Feathers!!!! This Mango Trick Training Hot Rod Racer Bird Scooter has just the right style and class. "Small guys" love to feel the wind in their feathers just like the "big guys" do. Fashioned after the Mango Champion Racer Bird Scooter, the Mango Hot Rod Racer Bird Scooter gives your Cockatiel/Conure size bird an opportunity to hug the road with ease or just take a leisurely cruise. 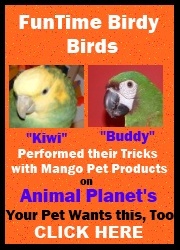 Ideal trick training bird scooter for Cockatiels, Conures, Quakers, Senegals, Caiques, Meyers Parrots and...all similar sized birds.